Bring on the Boom Boom! Tasting Date: 28 November 2013. Brief: Definitely good drinker at opening. Excellent option for dining out. Surprised how well this wine is drinking for a 2012. Ready to drink today and over the next 5 years. Full of Washington Syrah goodness and at a reasonable price. 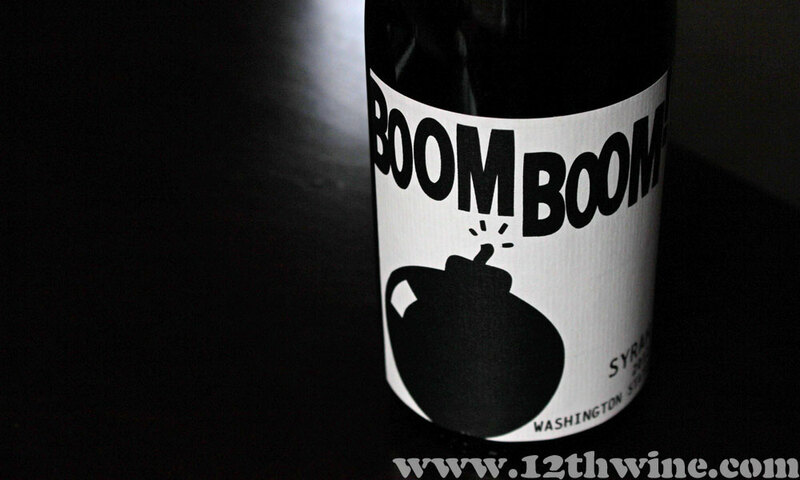 A recommended wine for those unfamiliar with Washington Syrah. Yeah, recommended for Syrah drinkers too! Notes: Smooth, most of the flavor up front at opening, currant and canned plum. A little air and violets with bacon fat. Back palate had tar, black licorice. At 40 minutes peppery fruit lower note on the nose with some beef jerky and blueberry on the palate, long finish. At 50 minutes fresh tobacco added to the dancing nose. Interesting. At an hour the wine was plush, back palate and cheeks full of flavor – dark fruit, smoky, tobacco, plum, blueberry with a big finish, gently dry on the gums, integrated acid. BIG LIKE.